BLOOMINGTON, Ind. 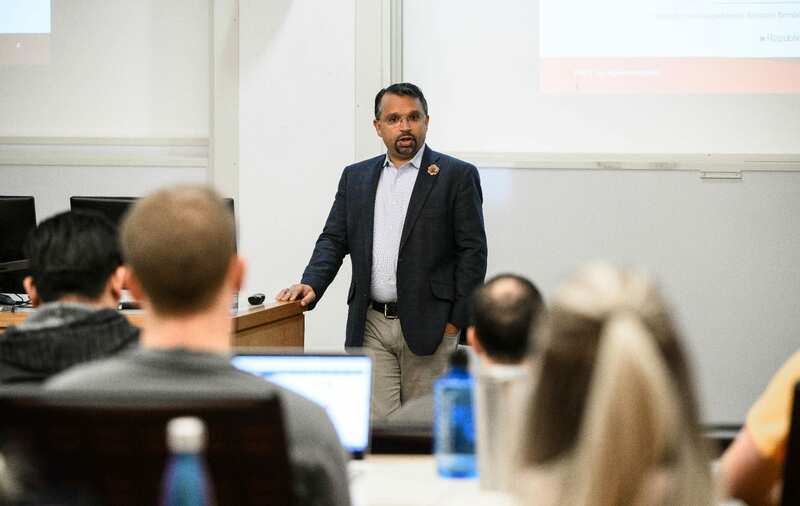 – Indiana University’s Kelley School of Business and its 3/2 MBA Program welcomed Rohit Kumar, a principal at PwC LLP and leader of the firm’s tax policy services group in its Washington National Tax Services practice. Kumar provided a unique perspective. He has extensive knowledge of government and public policy. Before joining PwC in 2013, he worked closely with three Senate leaders on Capitol Hill, including seven years with current Majority Leader Mitch McConnell, for whom he served as domestic policy director and deputy chief of staff. He helped to develop and implement tax, trade, budget and health care policy for McConnell as well as former Sens. Trent Lott, Bill Frist and Phil Gramm. Kumar met with Kelley students on Dec. 10 and discussed an understanding of policy issues as crucial to many companies, particularly as they develop strategies from both a technical and political perspective. PwC recruits at Kelley, particularly students in the 3/2 MBA Program, which offers them an understanding of accounting principles combined with business fundamentals. This was the first time Kumar has visited a business school in his current leadership role at PwC. “We were pleased to welcome Rohit Kumar to IU, Kelley and Graduate Accounting Programs,” said Patrick Hopkins, the program’s chair. “As a former chief negotiator in the U.S. Congress, Rohit brought truly impressive set of knowledge and experiences that shaped U.S. budget policy during the last decade. 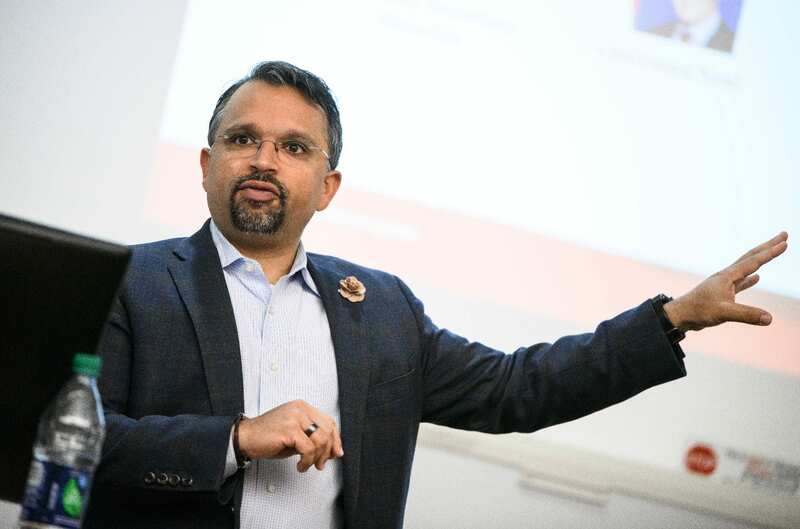 “Rohit offered students and faculty a glimpse of the centrally important factors affecting business and society today,” added Hopkins, also the Sungkyunkwan University Professor at Kelley. Q: The Kelley School appreciates your taking invaluable time away from your activities in Washington. Why did you think it was important to visit the Kelley School? Kumar: “It’s as simple as, “Dave asked (referring to David Greene, clinical professor of accounting), and the team thought it would be a nice opportunity. I’ll be honest, I did my due diligence. I asked if this is something I should do with my most precious resource, which is my time. We appreciate Kelley’s commitment to its students and how the school provides opportunities to expose future practitioners and future business leaders to real-world policymakers. We appreciate the interactions. Q: You have 15 years of experience helping to frame policy, not only in the area of taxes, but in other areas impacting the economy. Please explain how knowledge of the legislative process benefits clients. In response, Kumar explained that legislative process at times can become predictable, which was the factor he cited in reaching his decision to leave Capitol Hill, and other times it’s the opposite. Kumar: “Whenever we got into some big negotiation, or some big dispute between the political parties, I generally had over the years developed a pretty good sense as to how it was going to end, which was an advantage because we could race to the finish and wait for others to join us. That provided time to think through some of the finer details of how that final negotiation would unveil. Q: How does that process compare with what you see in the business community? “It turns out that in the private sector if you can predict with some degree of confidence how a big negotiation is going to end or what the terms of the debate are going to look like in the final analysis, clients are really interested in that, especially as it relates to tax policy. “But with policy more generally – whether it’s trade or tax or healthcare or anything else – we help clients understand the pressures that members of congress are facing. We tell clients what are the negotiable parameters and the non-negotiable parameters. Sometimes we need to have conversations with them about resetting expectations based on the most likely outcome. There are some fixed constants in my experience on Capitol Hill, but in a world of limited time and limited political capital, a more productive effort might be for businesses to work on the things where there is some give in the system. “It’s funny, and I’ve found this to be true not just for me but also for others who have worked on Capitol Hill and are now in the private sector, there are things to me that seem blindingly obvious, but it turns out that I’m just looking at the world from a different way. I continue to be surprised at what I consider to be obvious observations that are not obvious at all. And that’s what you get for 15 years on Capitol Hill. Q: How would you describe the current environment for Kelley graduates entering the field of tax consulting amid this time of great change? Kumar: “It’s an environment of almost unbounded opportunity, in the sense that we’ve got this new tax regime in place and it’s an opportunity to get in on the ground floor. You’re not burdened by knowing how things worked in the last 30 years. You’re not burdened by all of the doctrines and theories of the ‘case’ from 1986 to 2017. You get to start fresh. Q: Please explain the role of consultants in addressing major issues on behalf of their clients. Kumar: “I think the role that consultants play is to help clients translate their message into a language that elected officials, politicians and administration officials understand. My experience has been that with elected officials, senators and House members, the way they approach problems is not identical to the way corporate executives approach problems. “Someone has to be able to speak both languages and translate. Someone who is good at it is someone who can understand what the corporate community is saying and what is animating their concerns and then be able to help them put it into a language that will be understandable to an elected official and makes sense given their world view. Q: What might a student not yet realize about the value of understanding tax strategy? Kumar: “Done correctly, tax strategy has an integral role to play in business planning. We see clients respond to the incentives in the code and government with solutions. Understanding the intersection of policy and business planning is important to understand and easily overlooked and ignored. It can have outsized consequences if done incorrectly. Q: The IU Kelley School of Business is one of the places where PwC pursues top, young talent. What makes Kelley, its faculty and students so distinctive?